It all begins with a correspondence between two quite different women: 28-year-old Sara from Haninge, Sweden, and 65-year-old Amy from Broken Wheel, Iowa. After two years of exchanging books, letters and thoughts on the meaning of literature and life, Sara, who has never been anywhere in her life, decides it’s time to visit Amy. But when she gets there, she finds her friend’s house empty, Amy’s funeral guests just heading home…So, Sara finds herself all alone. But what choice do the inhabitants of Broken Wheel have but to take care of their bewildered tourist? And what choice does Sara have, faced with a growing desire to honour her friend and her beloved little town, but to set up her perfect bookshop with all the books she and Amy shared – from Joyce Carol Oates and Iris Murdoch to Bridget Jones and Little House on the Prairie? 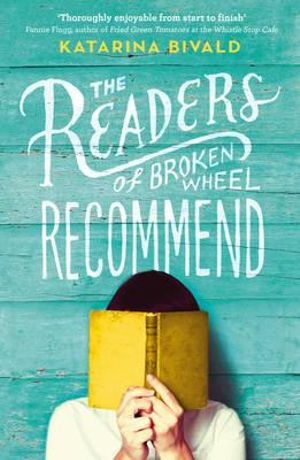 As our first read together the “Dundas Readers” had a mixed response to Swedish author Katarina Bivald’s first novel, “The Readers of Broken Wheel Recommend”. In our initial meeting in July we had selected this novel because of its quirky title and its suggested study of relationships. Most of us felt we could recommend it as a light read although the characters were not fully developed and the small USA town of Broken Wheel and its neighbouring town of Hope were in some ways unrealistic. The author’s style in using letters from Amy to her Swedish pen pal Sara was successful in introducing Amy to us, who otherwise is not alive at the time of the story. On a scale of 1-10 we gave it a 6. This entry was posted in Book Club Kits, Book Reviews, Fiction and tagged book kit, book review by Jody. Bookmark the permalink.